Imaging procedures showed up frequently on the American Board of Internal Medicine Foundation’s recent list of tests and procedures that “patients and physicians should question.” The foundation’s Choosing Wisely campaign wants to spark discussion among doctors, patients, and others in healthcare about tests and procedures that may not be necessary. Being on the list doesn’t mean the procedure is always unnecessary, rather that the available evidence suggests it may be. In February, the Choosing Wisely campaign released its second batch of recommendations from 17 medical specialties, with each specialty society including five tests or procedures it believes—based on the available evidence—may be unnecessary and could be harmful. The first batch of recommendations was released in 2012, with the ACR being one of the first nine specialties represented. The following list includes the imaging procedures each society put on their respective list and excerpts from their evidence-based reasons as to why they were chosen. • Don’t perform routine annual stress testing after coronary artery revascularization. Routine annual stress testing in patients without symptoms usually does not change management. This practice may lead to unnecessary testing without any proven impact on patient management. • Don’t use nuclear medicine thyroid scans to evaluate thyroid nodules in patients with normal thyroid gland function. Nuclear medicine thyroid scanning does not conclusively determine whether thyroid nodules are benign or malignant. These scans are useful for evaluating the functional status of thyroid nodules in patients who are hyperthyroid. Cold nodules on thyroid scans will still require biopsy. • Avoid using a CT angiogram to diagnose pulmonary embolism in young women with a normal chest radiograph; instead consider a radionuclide lung study (V/Q study). When the clinical question is whether pulmonary emboli are present, a V/Q study can provide the answer with lower overall radiation dose to the breasts than can CT angiography, even when performed with a breast shield. • Don’t use PET imaging to evaluate patients with dementia unless a field specialist has conducted an assessment. Without objective evidence of dementia, the potential benefit of PET is unlikely to justify the cost or radiation risk. 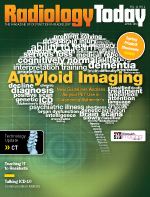 Dementia subtypes have overlapping patterns in PET imaging. Clinical evaluation and imaging often provide additive information and should be assessed together to make a reliable diagnosis and to plan care. For beta-amyloid PET imaging, it is currently unknown what a positive PET result in a cognitively normal person means; this method is not established for an individual prediction. • Don’t use coronary artery calcium scoring for patients with known coronary artery disease (including stents and bypass grafts). Coronary artery calcium scoring is used for evaluating individuals without known coronary artery disease and offers limited incremental prognostic value for individuals with known coronary artery disease, such as those with stents and bypass grafts. • Don’t order coronary artery calcium scoring for preoperative evaluation for any surgery, irrespective of patient risk. No evidence exists to support the diagnostic or prognostic potential of coronary artery calcium scoring in individuals in the preoperative setting. This practice may add costs and confound professional guideline-based evaluations. • Don’t order coronary artery calcium scoring for screening purposes on low-risk asymptomatic individuals except those with a family history of premature coronary artery disease. Net reclassification of risk by coronary artery calcium scoring, when added to clinical risk scoring, is least effective in low-risk individuals. • Don’t routinely order coronary CT angiography (CCTA) for screening asymptomatic individuals. CCTA findings of coronary artery disease stenosis severity rarely offer incremental discrimination over coronary artery calcium scoring in asymptomatic individuals. • Don’t order follow-up or serial echocardiograms (ECGs) for surveillance after a finding of trace valvular regurgitation on an initial ECG. Trace mitral, tricuspid, and pulmonic regurgitation can be detected in 70% to 90% of normal individuals and have no adverse clinical implications. The clinical significance of a small amount of aortic regurgitation with an otherwise normal echocardiographic study is unknown. • Don’t repeat ECGs in stable, asymptomatic patients with a murmur or click where a previous exam revealed no significant pathology. Repeat imaging to address the same question when no pathology has been previously found and there has been no clinical change in the patient’s condition is not indicated. • Avoid ECGs for pre- or perioperative assessment of patients with no heart disease history or symptoms. Perioperative echocardiography is used to clarify signs or symptoms of cardiovascular disease or investigate abnormal heart tests. Resting left ventricular function is not a consistent predictor of perioperative ischemic events because even reduced left ventricular systolic function has poor predictive value for perioperative cardiac events. • Avoid using stress ECGs on asymptomatic patients who meet low-risk scoring criteria for coronary disease. Stress echocardiography is mostly used in symptomatic patients to assist in diagnosing obstructive coronary artery disease. There is little information on using stress echocardiography in asymptomatic individuals for the purposes of cardiovascular risk assessment, as a stand-alone test, or in addition to conventional risk factors. • Avoid transesophageal echocardiography (TEE) to detect cardiac sources of embolization if a source has been identified and patient management will not change. Tests whose results will not alter management should not be ordered. Protocol-driven testing can be useful if it serves as a reminder not to omit a test or procedure but should always be individualized to the patient. While TEE is safe, even the small degree of risk associated with the procedure is not justified if there is no expected clinical benefit. • Don’t conduct imaging for lower back pain within the first six weeks unless red flags are present. Red flags include severe or progressive neurological deficits or when serious underlying conditions such as osteomyelitis are suspected. Imaging of the lower spine before six weeks of continued symptoms does not improve outcomes but does increase costs. Lower back pain is the fifth most common reason for all physician visits. • Don’t use dual-energy X-ray absorptiometry (DXA) screening for osteoporosis in women younger than 65 or men younger than 70 with no risk factors. DXA is not cost-effective in younger, low-risk patients but is cost-effective in older patients. • Don’t screen for carotid artery stenosis in asymptomatic adult patients. There is good evidence that for adult patients with no symptoms of carotid artery stenosis, the harms of screening outweigh the benefits. Screening could lead to nonindicated surgeries that result in serious harms, including stroke, myocardial infarction, and death. • Don’t perform carotid artery imaging for simple syncope without other neurologic symptoms. Occlusive carotid artery disease does not cause fainting but rather causes focal neurologic deficits such as unilateral weakness. Thus, carotid imaging will not identify the cause of the fainting and instead increases cost. Fainting is a frequent complaint, affecting 40% of people during their lifetime. • Don’t order CT scan of the head/brain for sudden hearing loss. Using CT scanning is expensive, exposes the patient to radiation, and offers no useful information that would improve initial management. Scanning may be appropriate in patients with focal neurologic findings, a history of trauma, or chronic ear disease. • Don’t routinely obtain radiographic imaging for patients who meet diagnostic criteria for uncomplicated acute rhinosinusitis. ￼Imaging of the paranasal sinuses, including plain film radiography, CT, and MRI, is unnecessary in patients who meet the clinical diagnostic criteria for uncomplicated acute rhinosinusitis. Acute rhinosinusitis is defined as up to four weeks of purulent nasal drainage (anterior, posterior, or both) accompanied by nasal obstruction, facial pain/pressure/fullness, or both. Imaging may be appropriate in patients with a complication of acute rhinosinusitis, comorbidities that predispose them to complications, and in whom an alternative diagnosis is suspected. • Don’t obtain CT or MRI in patients with a primary complaint of hoarseness prior to examining the larynx. Examination of the larynx with a mirror or fiberoptic scope is the primary method for evaluating patients with hoarseness. After laryngoscopy, evidence supports the use of imaging to further evaluate vocal fold paralysis or a mass or lesion of the larynx. • CT scans are unnecessary in the immediate evaluation of minor head injuries in children; clinical observation/Pediatric Emergency Care Applied Research Network criteria should be used to determine whether imaging is indicated. Minor head injuries occur frequently in children and adolescents. Approximately 50% of children who visit hospital emergency departments with a head injury are given a CT scan, many of which may be unnecessary. Unnecessary exposure to X-rays poses considerable danger to children, including increasing the lifetime risk of cancer because a child’s brain tissue is more sensitive to ionizing radiation. Unnecessary CT scans impose undue costs to the healthcare system. Clinical observation prior to CT decision making for children with minor head injuries is an effective approach. • Neuroimaging is unnecessary in a child with simple febrile seizure. CT scanning is associated with radiation exposure that may escalate future cancer risk, and MRI also is associated with risks from required sedation and high cost. The literature does not support the use of skull films in the evaluation of a child with a febrile seizure. Clinicians evaluating infants or young children after a simple febrile seizure should direct their attention toward identifying the cause of the child’s fever. • CT scans are unnecessary in the routine evaluation of abdominal pain in children. Utilizing CT imaging in the emergency department evaluation of children with abdominal pain is increasing. The increased lifetime risk of cancer because of excess radiation exposure is of special concern given the acute sensitivity of children’s organs. There also is the potential for radiation overdose with inappropriate CT protocols. • Don’t perform MRI of the peripheral joints to routinely monitor inflammatory arthritis. ￼￼Data evaluating MRI for the diagnosis and prognosis of rheumatoid arthritis currently are inadequate to justify widespread use of this technology for these purposes in clinical practice. Although bone edema assessed by MRI on a single occasion may be predictive of progression in certain rheumatoid arthritis populations, routinely using MRI is not cost-effective compared with the current standard of care, which includes clinical disease activity assessments and plain film radiography. • Don’t routinely repeat DXA scans more than once every two years. Initial screening for osteoporosis should be performed according to National Osteoporosis Foundation recommendations. The optimal interval for repeating DXA scans is uncertain, but because changes in bone density over short intervals often are smaller than the measurement error of most DXA scanners, frequent testing—for example fewer than every two years—is unnecessary in most patients. Even in high-risk patients receiving drug therapy for osteoporosis, DXA changes do not always correlate with the probability of fracture. Therefore, DXAs should be repeated only if the result will influence clinical management or if rapid changes in bone density are expected. Recent evidence also suggests that healthy women aged 67 and older with normal bone mass may not need additional DXA testing for up to 10 years, provided osteoporosis risk factors do not significantly change. • A routine bone scan is unnecessary in men with low-risk prostate cancer. Low-risk patients (defined by using commonly accepted categories such as American Urological Association and National Comprehensive Cancer Network guidelines) are unlikely to have disease identified by bone scan. Accordingly, bone scans generally are unnecessary in patients with newly diagnosed prostate cancer who have a prostate-specific antigen level below 20 ng/mL and a Gleason score of 6 or less unless the patient’s history or clinical examination suggests bony involvement. Progression to the bone is much more common in advanced local disease or high-grade disease that is characterized by fast and aggressive growth into surrounding areas such as bones or lymph nodes. • Don’t perform ultrasound on boys with cryptorchidism. Ultrasound has been found to have poor diagnostic performance in the localization of testes that cannot be felt through physical examination. Studies have shown that the probability of locating testes was small when using ultrasound, and there was still a significant chance that testes were present even after a negative ultrasound result. Additionally, ultrasound results are complicated by the presence of surrounding tissue and bowel gas present in the abdomen. • Don’t order chest radiographs in children with uncomplicated asthma or bronchiolitis. National guidelines articulate a reliance on physical examination and patient history for diagnosing asthma and bronchiolitis in the pediatric population. Multiple studies have established limited clinical utility of chest radiographs for patients with asthma or bronchiolitis. Omitting chest radiography will reduce costs but not compromise diagnostic accuracy and care. • Patients who have no cardiac history and good functional status do not require preoperative stress testing prior to noncardiac thoracic surgery. Functional status has been shown to be reliable for predicting perioperative and long-term cardiac events. In highly functional asymptomatic patients, preoperative stress testing rarely results in management changes. It is therefore appropriate to proceed with the planned surgery without it. Cardiac complications are significant contributors to morbidity and mortality after noncardiac thoracic surgery, and it is important to identify patients preoperatively who are at risk of these complications. The most valuable tools in this endeavor include a thorough history, physical exam, and resting ECG. Cardiac stress testing can be an important adjunct in this evaluation, but it should be used only when clinically indicated. • Don’t perform a routine predischarge ECG after cardiac valve replacement surgery. Predischarge cardiac echocardiography is useful after cardiac valve repair. It provides information regarding the integrity of the repair and allows the opportunity for early identification of problems that may need to be addressed surgically during the index hospitalization. Unlike valve repair, there is a lack of evidence that supports the routine use of cardiac echocardiography predischarge after cardiac valve replacement. Scenarios that would justify the use of predischarge cardiac echocardiography include the inability to perform intraoperative TEE, clinical signs and symptoms worrisome for valvular malfunction or infection, or a large pericardial effusion. • Patients with suspected or biopsy-proven stage 1 non–small-cell lung cancer (NSCLC) do not require brain imaging prior to definitive care in the absence of neurologic symptoms. The incidence of occult brain metastasis in stage 1 lung cancer is low (below 3%), so routine brain imaging results in increased costs and delays in therapy, and rarely changes patient management. False-positive studies occur in up to 11% of patients, resulting in further invasive testing or incorrect overstaging with potentially tragic effects on treatment decisions and outcomes. Some clinicians perform routine screening by brain MRI or CT scans to rule out occult brain metastasis in asymptomatic patients prior to surgical resection of early-stage lung cancer. This practice has not been evaluated by a randomized clinical trial and may not be cost-effective or medically necessary. Pooled data from retrospective studies that included a comprehensive clinical evaluation demonstrated that only 3% of patients who have a negative neurologic evaluation present with intracranial metastasis. One study, limited to stage 1 patients, reported a prevalence of 1.3%. The joint statement of the American Thoracic Society and the European Respiratory Society did not advocate preoperative imaging of the brain in patients with NSCLC who present without neurologic symptoms, and the current National Comprehensive Cancer Network NSCLC guidelines do not recommend preoperative brain imaging for asymptomatic patients with stage 1 non–small–cell lung carcinoma. • Don’t reimage deep vein thrombosis in the absence of a clinical change. Repeat ultrasound images to evaluate the response of venous clot therapy do not alter treatment. • Avoid cardiovascular testing for patients undergoing low-risk surgery. Preoperative stress testing does not alter therapy or decision making in patients facing low-risk surgery.